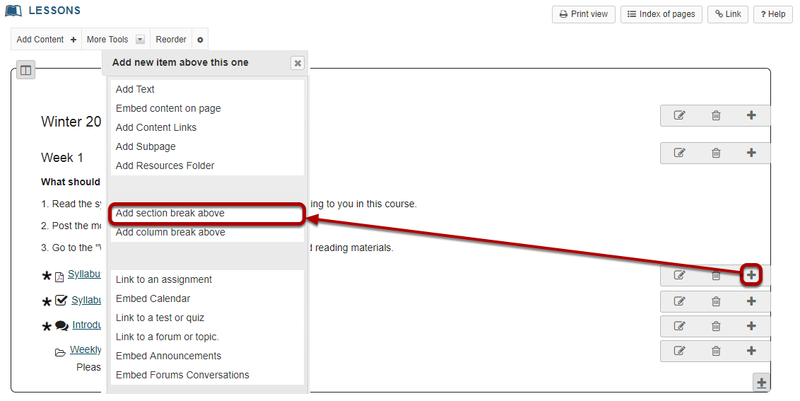 Sakai Community DocumentationSakai 19 User Guide (English) LessonsHow do I create multiple sections on a Lessons page? When content items are added to a Lessons page, everything is displayed in a linear order vertically in one block with rounded-corner borders. Visually, it appears as one block. Adding multiple sections on a Lessons page breaks up this one big block into smaller blocks so that the page is more readable and visually more appealing. 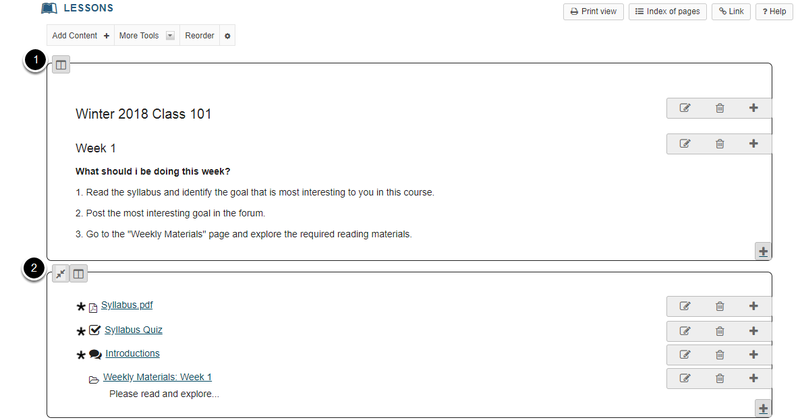 A section is defined as one block with rounded-corner borders from the left edge to the right edge of one Lessons page. One section may contain one or multiple columns. Creating sections involves 3 steps. Click an item's + button and Add Section Break Above. Zoom: Click an item's + button and Add Section Break Above. Use the + button to the right of the item to which you want to add a section break above. This will open the Add menu. Click Add section break above. Zoom: View the section break. This will break the big block into two sections. Each section has a few content items surrounded by rounded-corner borders. Prev: How do student add content to Student Pages in Lessons? Next: How do I create two columns on a Lessons page?